Glacier National Park is hands-down our favorite American national park. We visited this park twice for a total of 8 days and loved every minute of it! If you haven’t visited it yet, you should. As simple as that. 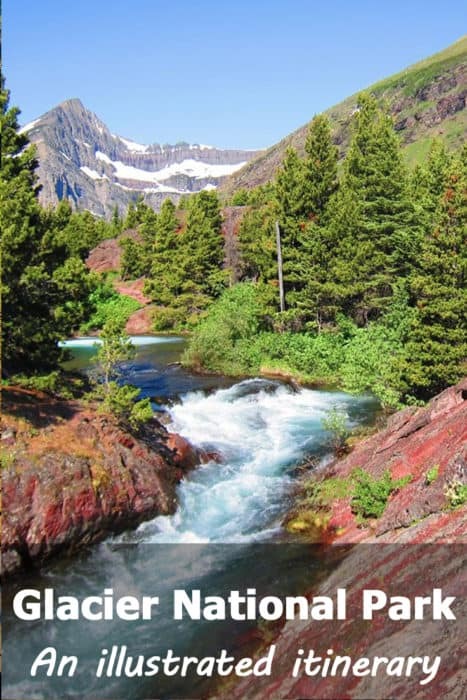 Here’s a sample Glacier National Park itinerary for you. All of the photos were taken by me during our visits. Yes, it really is that stunning. 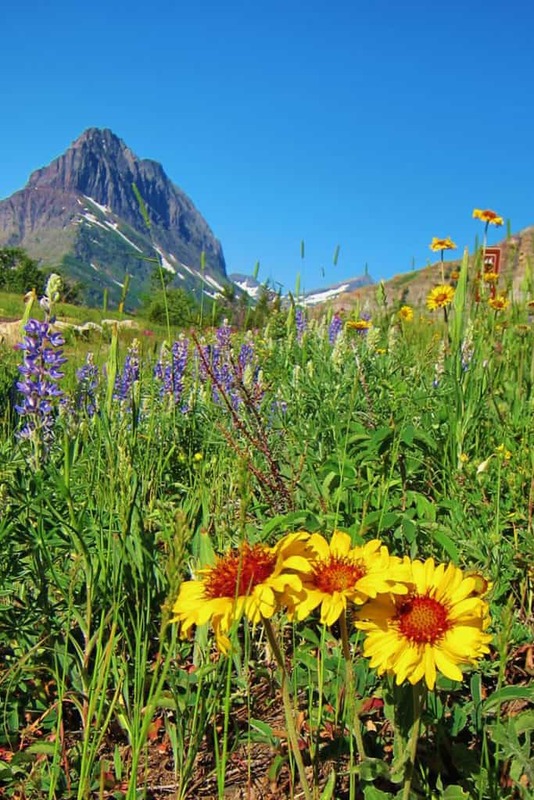 This Glacier National Park itinerary offers a flexible plan that will take you through the very best the park has to offer in three days and two nights. Is that enough time? Of course not! 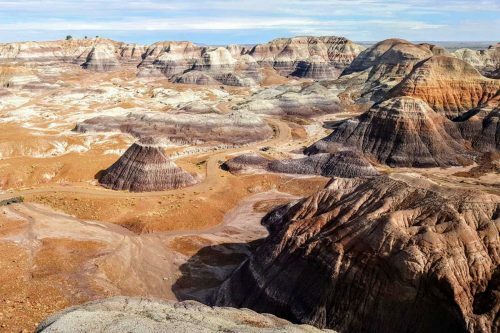 This park has gorgeous views everywhere you look, so you can easily spend a month here, exploring the trails. But let’s be realistic here. 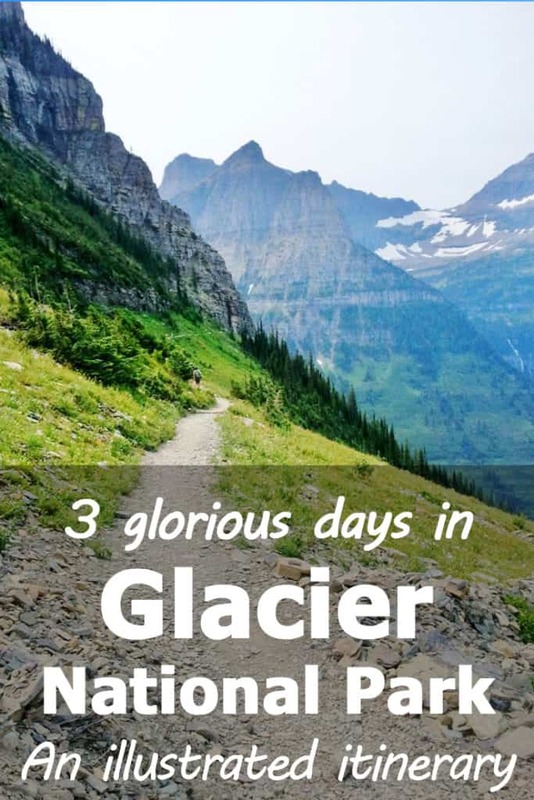 Most people visit Glacier as part of a road trip to the Rockies and can’t afford to spend more than three or four days at the same place. And what if you manage to squeeze that fourth day out of your trip plan? Awesome! I’ve added a fourth bonus day for you! And… I’ve put it all into one cool image with lots of eye candy. And when it comes to eye candy, Glacier NP can give you a real sugar rush. See for yourself (and please pin on Pinterest too!) You’ll also find a more detailed text-version further down the post, a map and a picture gallery. This trip plan takes you from the west side of the park, to the east side. Feel free to reverse the directions according to your road trip needs. The mileage for all trails shown here is for your total return distance. Please, always check with the rangers before going on the trail to make sure there are no closures or usage limitations. 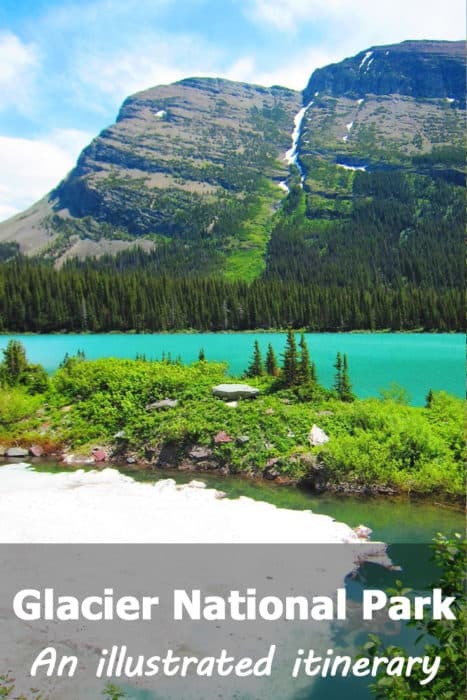 Where to stay during your Glacier Park trip? You’ll be starting your journey at the western entrance to the park so there will be many motels and hotels in the nearby towns. Hungry Horse and Columbia Falls are two small towns very near the park. If you can’t find accommodation there, try Whitefish or even Kalispell. Once you cross the Going To The Sun road, accommodation becomes more expensive, so book in advance if you want to get cheaper rooms. You can stay either at St. Mary’s Lodge or at the Swiftcurrent Motor Inn at Many Glacier. If budget isn’t a problem, you can even stay at the Many Glacier hotel. 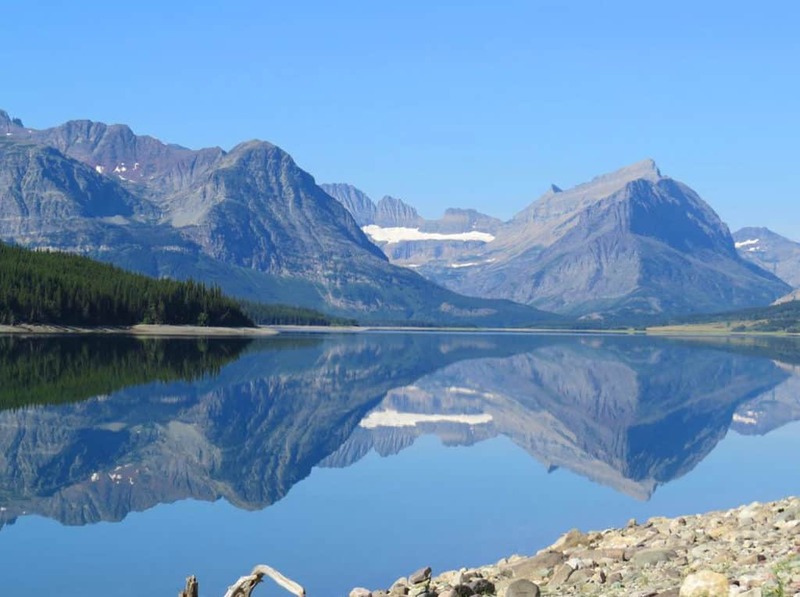 And here’s the text version of the Glacier National Park Itinerary! Enter the Going To The Sun Road from West Glacier. Stop to see Mcdonald creek at the Mcdonald Falls trailhead. Stop at Sunrift Gorge & Wild Goose Island for pictures. Get an early start! Grab a coffee & pastry at Glacier Perk and head out to Many Glacier. Take the Grinnell Valley Boat Trip & Hike 3½ to 4 hours, easy 2.5-mile (also available as a ranger-lead hike). Get huckleberry ice cream at the store for dessert! From here, you’re on your own! Drive on to your next destination to save on the costs of park accommodation. Mister, can you spare a day? 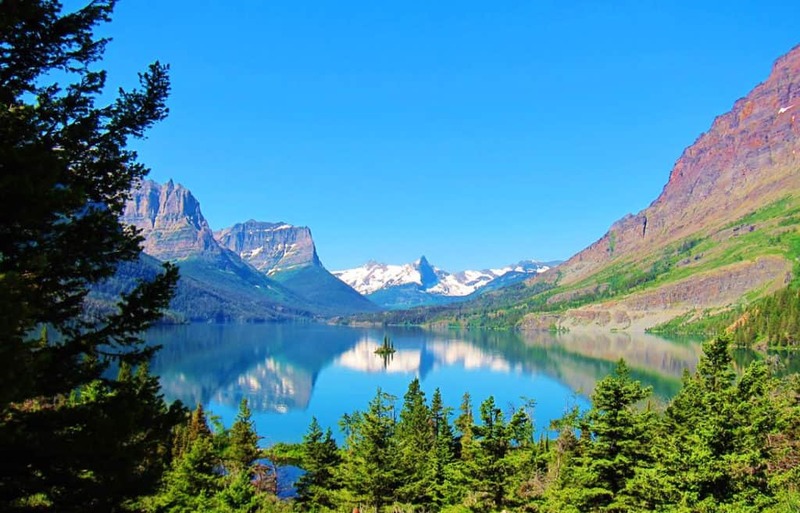 If you can add a day to your Glacier National Park itinerary, then use that it to visit the Waterton Lakes region, on the other side of the border. Grab a coffee and pastries at the store at Swiftcurrent Motor Inn and head out north. Visit Cameron Falls for some awesome pictures. Visit Cameron Lakeshore and if you’re up for it, take the 1.9 miles long trail. Have you visited this awesome park yet? If so, let me know what you liked best about it and share your own tips in a comment! If you haven’t visited it yet, would this be something you’d like to do in the future? I love reading your comments (and promise to answer any of them!) 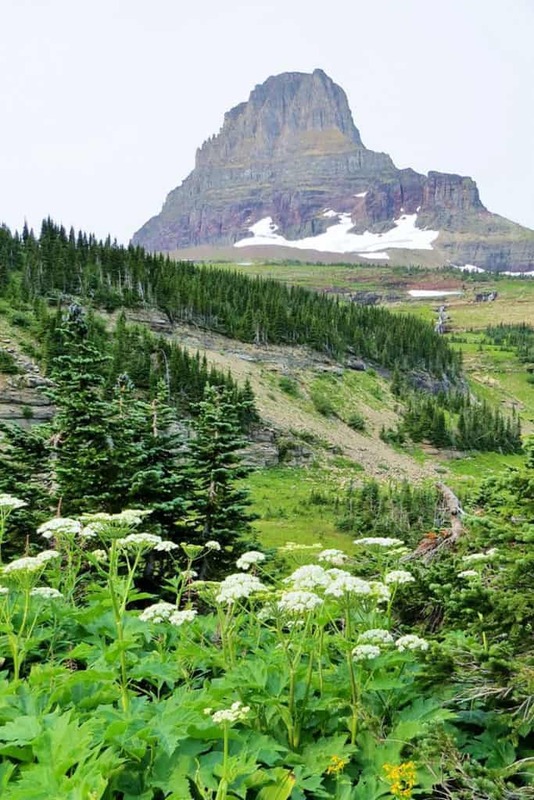 and please help me spread the word about Glacier National Park by sharing this post on Twitter, Facebook and Pinterest. What is the best airport to use for a visit to Glacier? I think that would be the one in nearby Kalispell, MT. I love the site it’s the best one I’ve been able to find describing Glacier and detailing activities. I am planning an RV trip and we are not towing a vechichle. As a result I cannot drive the GTTSR. I’m pretty depressed about it because that seems to be the highlight of most people trip. What’s you recommend. Do I need to figure out how to see GTTSR? Would my trip and opinion of Glacier be diminished if I skipped the GTTSR? I’ve considered renting a car in west glacier and doing the drive but was trying to do our vacation cheap this year. Also what do you recommend for RV campsites I. The park? I was planning on 2-3 days at Glacier so I could stay a day in the west then drive the south road to the east and stay a day on the east? Is this worth it or would I be better off focusing on the East or West? So glad you like our blog! Depending on the number of travelers, see whether the Red Bus might be cheaper than renting a car. If you like hiking, I think Many Glacier is where you want to camp for at least two nights, possibly more. They have a first-come-first-serve RV campground near the hotel, here’s the link. The location is fantastic and I can see in the link that you can actually make reservations as well. There are also campgrounds (including a KOA) near St. Mary’s but if you want to hike in the Many Glacier area and don’t have a toad, the Many Glacier campground is the right spot for you. It puts you right at the trailheads. There are a bunch of campgrounds on the Western side of the park. That entire section is all RV parks, pretty much. Again, if you want to hike without moving the rig, I think you’ll need to plan ahead, see which trails you want to hike and stay the night in that specific area. Depending on your overall trip route and what you prefer to do, I would consider camping in the Many Glacier area for 3 nights, and then taking the red bus to cross the GTTSR and back on one of them. It might be enough for seeing the west side of the park too. If you plan on crossing with the RV anyway (taking the southern road) then I would split it into 2 nights in Many Glacier and one in the west. I hope this helps! Hi! Do you have an opinion on the best campgrounds to use when following your itinerary? My daughter and husband want to camp (I would rather a cabin or hotel but I’m going along with the program!) and I’ve never had experience with booking campground stays. I’d love to take lots of photographs of nature, wildflowers, landscape, wildlife etc. too. 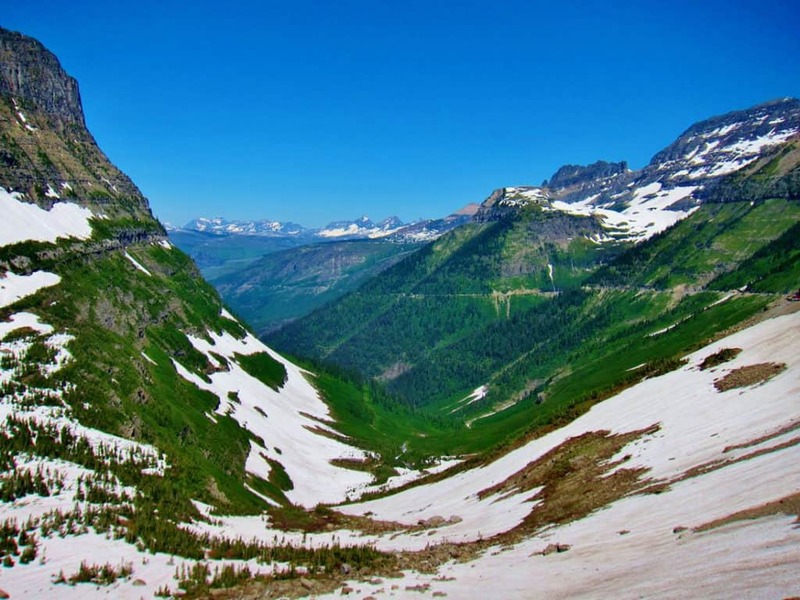 This itinerary is focused on Many Glacier – IMO the best area in the park – so the campground of choice would be Many Glacier campground. Now, looks like they don’t take reservations so in that case, I reverse the order of the trip and start at Many Glacier, leaving the Going to the Sun Road for the last day of your trip. I would try to spend the night before you go camping as close to Many Glacier as you can, then drive there and get your spot. Depending on where you come from, maybe find a cheap motel in Shelby, MT or even Cut Back for the night, then head out early in the morning and set camp at Many Glacier which will serve as your base for 3 nights. After the last night there, cross the park to the other side via GTTS road. We stayed at Under Canvas a glamping experience. We loved it, very close to the park and you don’t have to bring camping gear. It is right outside West Glacier. They had evening programs, s’mores, offered box lunches and breakfasts to go. Highly recommend. Thanks for the recommendation, Susan! Sounds like a great experience! Loved your site – helpful! I am going the first week in June 2018 and realize the GTTS road may not be open! I have 2 days and love to hike (not too strenuous/steep – I can go long distance though) and photograph. If I have to do either the east entrance or west entrance is one significantly better? Thanks so much! So glad you find the site helpful! Don’t give up on the road just yet. If you look at the data going back 20 years, there have been years when the road was opened as early as May! 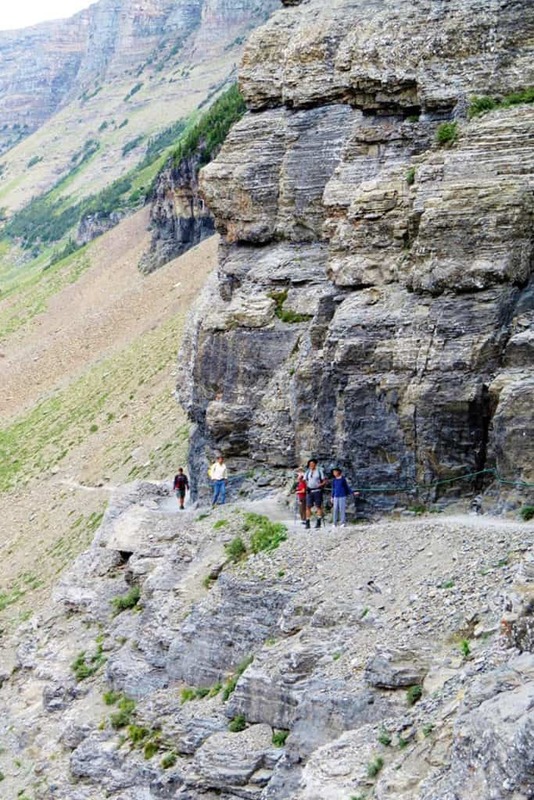 If the road is open by the time you arrive, definitely dedicate a day to crossing the Going To The Sun Road. We crossed it in 2011, a few days after it had been opened and it was amazing! There was water everywhere, still flowing from the snow capped mountain tops. We were literally driving through waterfalls! When we crossed the road in later years, it wasn’t so soon after the opening date and everything was dry. Still beautiful but not as thrilling. Should the road not be open – definitely can happen! – IMHO the more beautiful side is the eastern side. Specifically the Mani Glacier area. The western side is beautiful but it’s more about forests and rivers. The eastern side is where the steeper slopes are. It’s also where saw more wildlife. The hike to Grinnell lake is a classic and not steep at all (I did it with my two young boys). Continuing to Grinnell Glacier has more of an incline but if you’re reasonable fit, you shouldn’t have a problem. One thing to remember though is that when the GTTS road is closed, so are some of the trails. I would read up about the various trails and then go see the rangers first thing on arrival to see which are recommended on the day of your arrival. Enjoy Glacier! If you ever consider creating a trip report, I’d be delighted to post it here! Emily, I’m going in the end of May 2018 into the first week of June. It sounds like it’s still pretty snow packed. Going to the sun road is still 75% closed. We’re planning on camping in the McDonald Lake area. Avalanche lake, trout lake, and McDonald lake trail are the plans so far. While it’s my first time to the park, from what I’ve read, I think the west entrance is better for what you’re looking for. There are steeper hikes to the East – however, they have more spectacular views. Enjoy your trip! 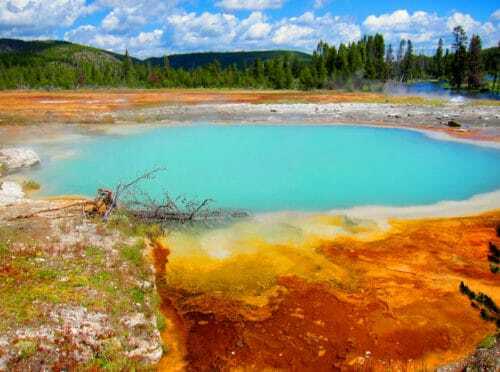 Heading to GNP in August! LOVE THIS Itinerary!! Very interested in the Grinnell Glacier, but did you continue on to the “Upper Grinnell Lake”? Thanks a ton for putting such a great compact outing together!! Cant wait to do it! So glad you liked the itinerary, Brianne! As far as I know, the Grinnell Glacier trails takes you all the way to Upper Grinnell Lake. I haven’t hiked it myself but my husband did and enjoyed every minute of it! It’s always a good idea to talk to the rangers before hiking Glacier NP to see if there are any updated regarding trail conditions, of course. Have a terrific visit – I’m jealous! I was just wondering where the second to last picture was taken? 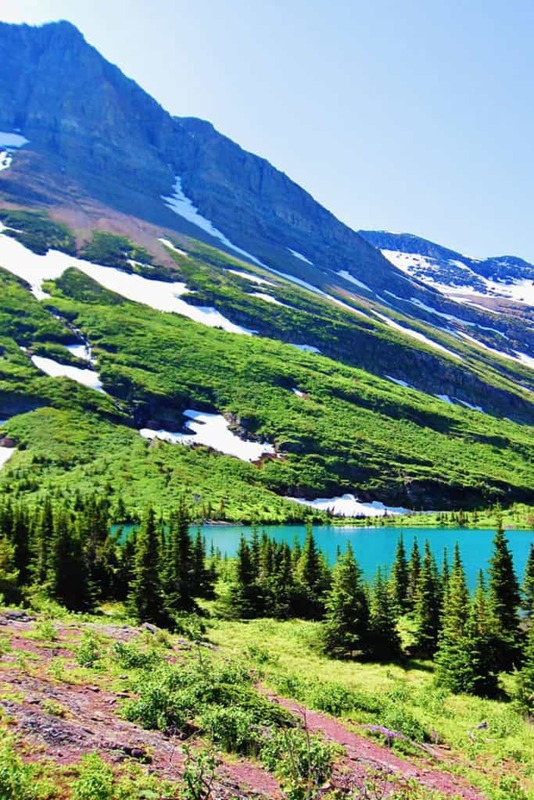 I am planning a trip to Waterton Park Alberta, Canada down to Glacier park at the end of May this year for 3-4 days. Will it be worth me going down to Glacier national park this early on in the year? Hi Chancey, the second to last picture was taken while hiking the Garden Wall trail. That trail begins at Logan Pass and goes all the way to Many Glacier. The kids and I, we just hiked for about a mile along the trail – the fun part where the trail is hugging the mountainside as you can see in the picture – and then went back to Logan Pass. My husband and a friend of ours went on and finished the hike in Many Glacier. Good question about May. The Going To The Sun Road will not be open. Mani Glacier should be open if you’re crossing over from the east. I’m sure many trails will still have snow and ice, so not sure about hiking that time of year but I bet it would be beautiful. I’d definitely go given the chance. We will be spending 2 days in Glacier NP this July and the only lodging we could get was in West Glacier. We are planning on driving the GTTSR one of the days we are there but is it too much to drive the whole thing and then back again in the same day? Should we only do part of it then turn around and go back? How many hikes can be done along the GTTSR and still have time to drive back? Which hikes should we do? What are must dos for the 2 days we are there? We are not all avid hikers and our pregnant daughter (5 months) and her young family (2 & 4 yr. old) will be with us. Sorry about the late reply, Barb! I somehow managed to miss several notifications. I hope this isn’t too late to answer. You can certainly travel the GTTSR and back on the same day. Some trails along the GTTSR will still have snow/ice on them even in early to mid-July. Hiking with toddlers and your pregnant daughter, you need to get the most recent information from the rangers about trail conditions. 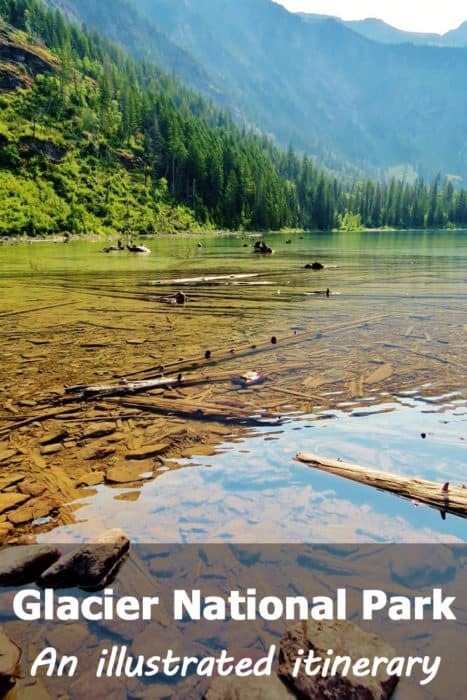 Since you’ll be staying in West Glacier, you can hike in that area on the day that you’re not crossing the park on the GTTSR and do the Trail of the Cedars (fully accessible – even for strollers). Then on the GTTSR day, make a few stops along the GTTSR to take in the views and maybe stroll along part of some trails (the ones the rangers recommend). Get to the other side of the park and drive for about half an hour longer to the Mani Glacier area. You can take a break there (they have a couple of restaurant and a little shop with great Huckleberry ice cream! ), maybe take the short hike to Fishercap lake to try and see some moose and then head back along the GTTSR to the west. Just make sure you leave the Mani Glacier area early enough so you’ll have plenty of daylight hours to drive back to West Glacier. I hope that helps – enjoy your trip! The park is absolutely gorgeous in July! We are in Sixties not hikers but relatively flat surface is fine. Does your itinerary require lot of hiking (going up the slope)? How tough is it? Hi Bankim, the problem with some of the trails is the length, not so much the elevation. Few trails are 100% flat but the ones I mentioned here (other than the ones marked “for hikers” are not very steep. I could do them and I’m anything but an avid hiker. I do use poles and that helps when there’s a short section with some elevation. To make sure the trails are a good match for your own personal preferences, you can Google for each trail or even look it up on YouTube. People record their hikes and I often check the movies when I’m not sure whether or not I want to try a specific trail somewhere. Also, don’t forget to talk to the rangers before you go on any of the trails as trail conditions can change and effect your experience. Have fun at Glacier NP! Thank you Anne. I will check it out on Google or You Tube. What is your opinion about taking Red Bus Tour? We are planning on staying at the Cedar Creek Lodge in Colombia Falls for 3 full days (4 nights). Hi! Can you please offer advice/info. My family is planning to visit GNP in July ’17. The hikes I keep reading about, are they free, do we have to register for them in advance? We will have our own car, and plan to drive East & West on Going To The Sun. I imagine Ranger led hikes may cost & we will need to register. We drove thru Yosemite once & I don’t want to miss these beautiful views, lakes etc Glacier offers. I envy you! Glacier is amazing during July! Ranger-led hikes are in fact free of charge. That’s the case in all national parks. The only time you have to pay is if the hike involves a boat ride, like the Grinnell Glacier hike+ Boat Ride. That means the ranger is on the boat there with you, explaining things on the way etc. but you really just pay for the boat ride itself. In 2016 that cost $26 per adult. 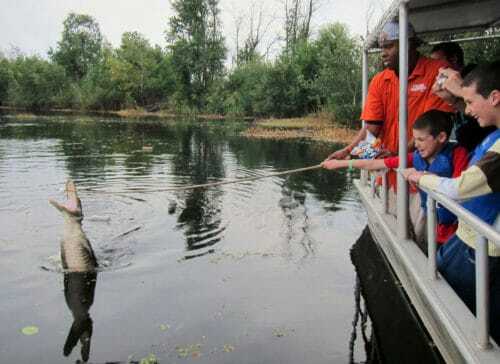 Anything that doesn’t include a boat ride and is just a ranger-led hike is free of charge. For the longer hikes, you may need to make a reservation the day before (you can do that in any of the visitors center or on the phone) but even that is not necessary in most cases. Here’s a link to the park’s brochure of ranger-led activities from the summer of 2016. You’ll get a similar one when you get to the park, or you can check their website around springtime when they’ll probably have the online version of the 2017 brochure. It’s a very helpful guide as it allows you to see what days and times of day the hikes/activities are and for almost all of them, you can just choose to join them on the spot, giving you maximum flexibility. Enjoy your trip and let me know if you have any other questions! Previous PostThe City Museum in St. Louis, MO – Better than Disneyland!